This will be a short post today but rest assured I have a story to tell. I need some pictures from the past in order to do that and so while I am in town for the dog food/chicken food and perhaps some people food run I am going to purchase a new printer/scanner. We had one but it never survived the episode of Colonel, one of our old dogs who has some issues with canine dementia, locking himself in the room where the computer and phone is. He had a total meltdown and ate half the door, the printer, the phone and several books. I never did replace it because well, I don’t really print much. But I have a whole shoebox full of pictures and they really should be scanned and stored. And there’s some good stories behind them too! It will also give me the opportunity to share some stories about the commenter “superior sibling” who is in fact my little sister and yes we are related contrary to her protests! I need a few of those pictures for the continuing fox story. Now the fox story is recent but it reminded me of a bear story and living with wildlife and so that’s where I’ll be headed next. First though I need to buy the printer. Let me just say that the fox is still alive. In fact several foxes are still alive. Apparently we are on a high cycle this summer. I found one chicken I thought was dead hiding in the shop. She and her three remaining friends are living in there while I fortify a new hen house. The little peepers were moved to a bigger brooder box and they are safely ensconced in the shed. Darrel was laid off from his job on Tuesday which is crappy news. He keeps saying we can live on love. I’ll remember to tell the bank that! And it’s been raining and raining and raining. After the chicken palace is done I may need to build an ark. 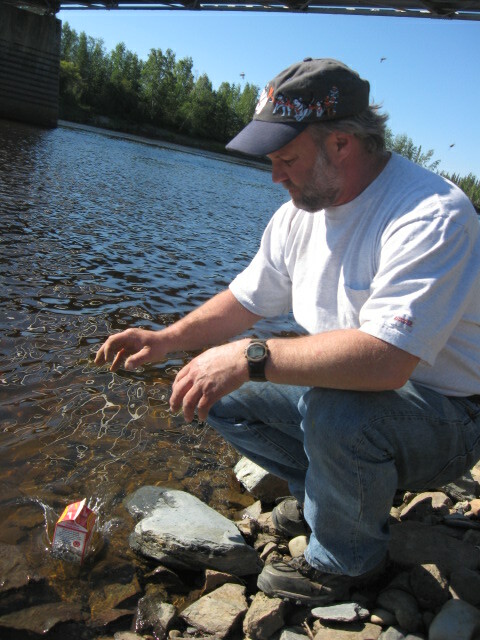 Darrel making a boat from a milk carton during a lunch stop at Birch Creek, part of the race route of the Yukon Quest. This is why I love him – he always makes something good happen! Here’s the thing though about our life. Somehow things always work out. And when it looks like it’s too hard we get to relive our many, many adventures. 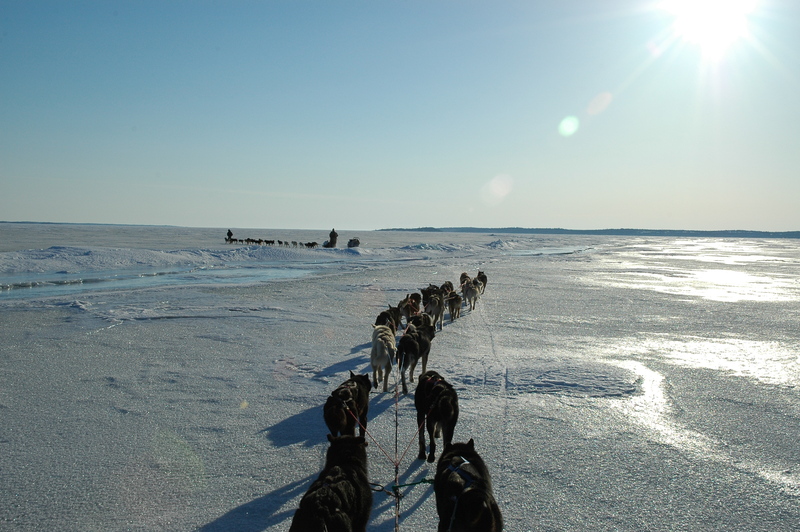 Here’s a photo taken by a friend, James Gill, from our dog sledding trip across the East Arm of Great Slave Lake. With memories like this life really can’t be that bad! Our spring trip across the east arm of Great Slave Lake in the Northwest Territories. Choose wisely on the pictures you post…coupled with the evidence I have I’m heading to mom and dad’s in August! ’nuff said!